The creative team behind the development of the world’s most sustainable building – The Edge in Amsterdam – has announced the launch of a real estate technology company. EDGE Technologies, launched by OVG Real Estate CEO Coen van Oostrom will focus on creating a new generation of buildings which feature the latest innovations in sustainability and wellbeing. Whereas parent company OVG is focussed exclusively on the development of its existing portfolio, EDGE Technologies will focus on both the development and the long-term operations of this new generation of buildings, aiming for a cohesive experience across cities. Each EDGE building will be built and operated on the same technology platform and offer consistent user-centred design, created to serve the needs of today’s fast-changing and demanding workforce. 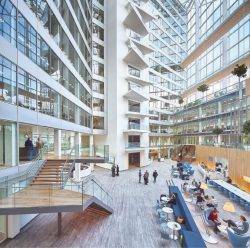 To help achieve this the new company is launching a product that will capture and aggregate data across its properties in order to optimize, measure and inform both the user experience and the building’s environmental performance. Van Oostrom, the real estate technology pioneer who founded OVG, said: “We live in a fast-changing age of innovation and transformation – all driven by the technological changes of the 4thIndustrial Revolution – yet the ones who can make change happen, the real estate industry, is largely stuck in the past. “Buildings are the number one polluter in the world, contributing to around 40 percent of carbon emissions, so most people still find themselves living and working in unhealthy environments. We created EDGE Technologies because we know the built environment can and must be part of the solution. EDGE Technologies is a pioneer in implementing a highly integrated network of IoT devices, bridging building and tenant systems into a seamless experience. Data analytics and machine learning allows continuous improvements for energy performance, occupancy and user productivity. Cloud computing combines data and learning across EDGE developed buildings and caters for integration with smart city grids. All EDGE buildings will run on the same technology platform connecting people working, the application, and building management systems to a single interface cloud. Data can then be used to update components and add new features through upgrades throughout the lifespan of the building. It allows EDGE Technologies to learn from all systems such as those mentioned before of energy, occupancy, use and maintenance, keeping them optimized from actual data. The main aim is to use this data to improve a building’s performance on a large-scale.